Dentistry is seeing an infiltration and prevalence of 3D imaging in recent years. However, I was interested to find out not only how but why someone would want to become a dental radiologist. Heidi shared her journey with us and talked about how she was a business major working in accounting when she realized she was in the wrong field. She knew she wanted to help people and had strong ties to the medical arena, which eventually lead her towards dental school. After graduating, she worked in general dentistry for six years. It was during this time that she discovered her passion for diagnostics. Her thirst for knowledge kept her on track, and she continued to learn more about 3D imaging and radiology. She believes that without 3D imaging, we wouldn’t have all of the opportunities we have right now. Deciding to become a radiologist was a combination of her drive to help others, her passion for diagnostics, science and general dentistry. Heidi is an associate professor in the Department of Radiologic Imaging at Loma Linda University School of Dentistry. She also works as an adjunct professor in the Department of Diagnostic Sciences at the University of North Carolina at Chapel Hill. So, it’s safe to assume Heidi is a very busy lady. I was keen to find out more about how she got into lecturing and public speaking. Heidi talked about her mentor, Dr. Don Tyndall, who is a professor in the Department of Diagnostic Sciences and General Dentistry at the UNC School of Dentistry. Dr. Tyndall has won several awards for teaching excellence at UNC and it was him who inspired and encouraged Heidi to pursue her teaching career. No, I don’t mean you have to clone yourself in a futuristic science lab but rather remain open to finding help and assistance from others. Dr. Tyndall is a perfect example of someone who had too much on their plate and instead of trying to do it all himself, he sought help from other qualified professionals such as Heidi. Heidi and I talked about all this and more on the podcast, including the benefits of collaborating with others to help yourself (and others) grow and flourish. What is a Dental Radiologist? A dental radiologist works with a variety of tools such as x-rays and MRI machines to both diagnose and treat patients. Their findings are also used to make recommendations to other oral surgeons. Dental radiologists require a lot of formal education, which is why many people assume it’s strictly academic based. However, Heidi emphasized the shift in dental radiology from academics to private practice. Private practice dental radiology is mainly web-based, and there’s a lot of IT skills involved. Heidi works with doctors who send their Cone Beam CT volume examinations to her to read and review. The two most common concerns dentists have with 3D imaging are radiation and liability. 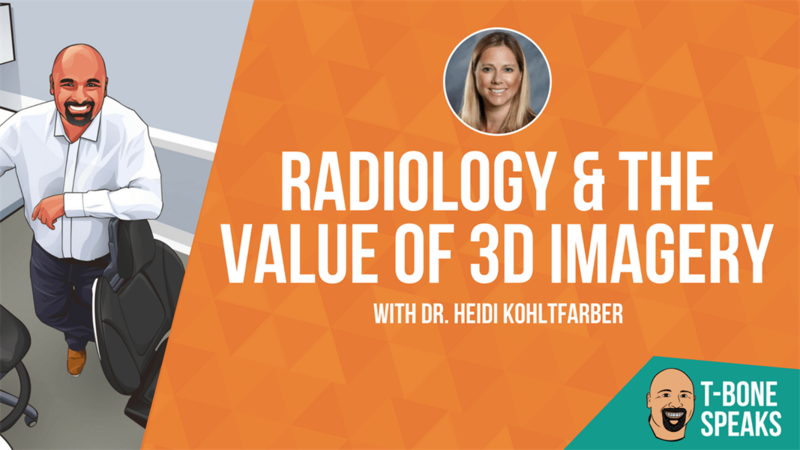 How much radiation comes with 3D imaging? And is it dangerous? Heidi addressed both of these concerns. When speaking about radiation, she noted that most people have these fears because they forget just how much radiation we’re exposed to on a daily basis. On an average day, we’re subjected to around 8.5 µSv (microsievert). But when we look at different machines in dentistry, radiation levels vary from 80 µSv up to 160 µSv (although some are much greater!). In other words, the amount of radiation from one 3D imaging machine or similar is equal to around 12 to 20 days of being alive on earth. It may seem like a lot. However, medical CT scans are equivalent to approximately 250 days of being alive on earth. In comparison, there’s far less radiation in dentistry than general health care. Heidi also addressed concerns about liability and 3D imaging or radiology. Heidi advises dentists to get a further education when/where possible. It’s important to keep learning after graduation so you can continue to improve and refine your skills. Not every scan has to be read by a radiologist. But if you look at it and something doesn’t seem right, refer it to where it needs to go and if you’re not sure, just ask! A good rule of thumb, if you’re not sure, is to compare things symmetrically. If one side looks visibly different than the other, that’s a clear sign that something might be wrong. 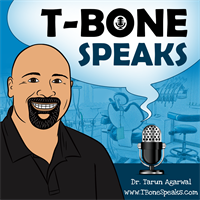 We talked about the benefits of 3D imaging in dentistry. One of the most beneficial reasons to implement it into your practice is the fact that it allows you to diagnose patients quicker and with greater accuracy because you can see a lot more with a 3D image than a 2D image. 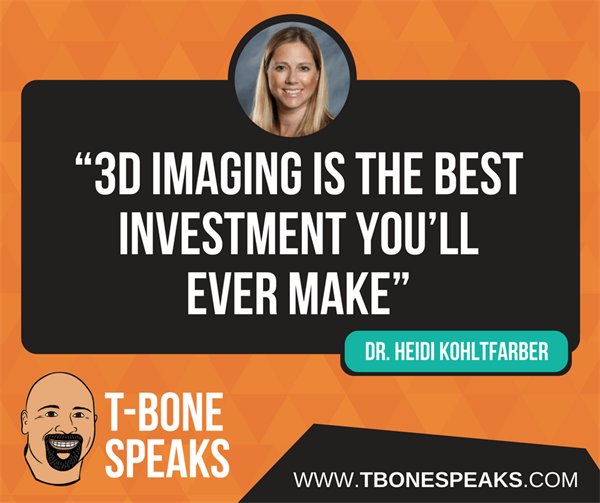 When asked what advice she would give dentists who are considering 3D imaging, she clarified that 3D imagery will be the best investment you’ll ever make. We also discussed Heidi’s business, Dental Radiology Diagnostics. She and her team provide a dental imaging interpretation service that helps dentists provide the highest quality care for their patients. If you’d like to find out more about Heidi and her business, you can visit her website to learn more and don’t forget to like their Facebook page! This article originally appeared on T-BoneSpeaks.com.